The city of Magadan, located on the Sea of Okhotsk is about as far away and isolated from Moscow as you can get. Magadan is a bustling city with museums and hotels near a dramatic coast of rocky bluffs interspersed with beaches. Bear, moose, and Siberian bighorn sheep live in the pristine mountains and wilderness just beyond the city. Visitors can easily fish, hike, and ski in the wild expanses outside of Magadan. But despite the tranquility at hand, this distant city still suffers from an image problem because of its unfortunate past. During the purges of the Stalin era, Magadan was the entryway to the Kolyma region, an area rich with gold deposits that became the center of the gulag system’s harsh labor camps. Prisoners were often shipped across Russia by train to Vladivostok on the Sea of Japan and crammed in ships that traveled north up the coast to the gold mines outside Magadan. Many didn’t even survive the journey to Kolyma. The prisoners who made it to Magadan and Kolyma endured frigid winters, malnourishment, and hard labor in the gulags. At the peak of their production, the Kolyma mines are estimated to have produced nearly half of the world’s gold each year. 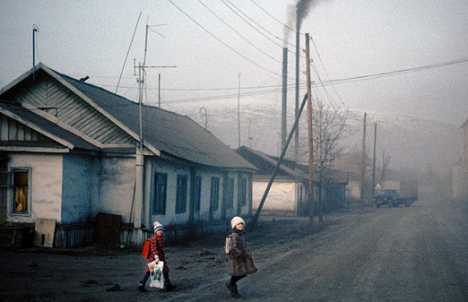 Over a million people—at least—are estimated to have died in the Kolyma region alone. The only road in to Magadan is the M-56 Federal Highway, also known as the ‘Road of Bones’ for the thousands of gulag prisoners who died during its construction. The nearest city of any relative size is Yakutsk, one of the world’s coldest cities, located 2,200 kilometers inland from Magadan on the Road of Bones. Despite being so far removed from civilization, Magadan has had its share of famous visitors. Renowned Polish writer and journalist, Ryszard Kapuściński, traveled to Magadan before the Soviet Union fell and wrote about it in his book, Imperium. During the Second World War, Henry Wallace, then Vice President of the United States, traveled to Siberia and the Far East to promote peace. Wallace visited Magadan in 1944. Local authorities removed all evidence of the labor camps before his visit, and took Wallace on a tightly-controlled tour. Wallace didn’t understand that his visit to Magadan was a charade, and he faced public ridicule for his naiveté upon returning home. Today, the gulags have faded into history and Magadan is a peaceful city by the sea. Whether you’re an adventure seeker, or a Russophile slowly checking Russia’s most far-flung cities off your travel list, you’ll bring back some great stories from Magadan no matter what time of year you visit. Worth checking out even if you’re not interested in the history of the gulags is Magadan’s Mask of Sorrow monument. Constructed in memory of those who died in Kolyma, its an impressive concrete statue of a face that rises from a hilltop above the city like an Aztec ruin. If you’ve come to Magadan to experience nature, take a relaxing stroll on the beach after viewing the monument. Magadan rests on crescent-shaped Nagaev Bay at the base of a peninsula that juts out into the sea. The city’s beach has some undeveloped stretches good for walking. The Magadan Regional History Museum has exhibits on the region’s flora and fauna, native people, and fine art. The Magadan State Music and Drama Theater began as a Soviet project during the days of labor camps, and today has become a venue for local performances. Magadan’s new cathedral shows off an impressive collection of onion-domes that is perhaps the most beautiful in all of the Far East. Visitors typically arrive in Magadan to fish, see some of the nearby gulag history, or at the end of a long overland trip along the Road of Bones. But even during a short trip to Magadan, you can do all of these things. Fishing is one of the principal industries in Magadan and its easy to organize a tour to cast a rod in the ocean, or fly fish for salmon and char in the Yama or Ola Rivers. Excellent fishing also awaits in the numerous mountain lakes of the northern Far East. Fishing excursions vary from quick day trips to camping expeditions by the river that last a week or longer. A number of bird species, including tufted and horned puffins, are also found around Magadan, especially on the coast. Many birdwatching and nature tours also start and end in Magadan. In the winter, several outfits run ski trips in the mountains and tundra inland from the sea. If you’ve arrived in Magadan to see gulags, the Dneprovsky camp is just over a half day’s trip from the city along the Road of Bones. Prisoners labored in a tin mine at Dneprovsky where visitors can still see watchtowers, and some of the camp’s original buildings. Another interesting stop on a trip through Kolyma’s past is the Butugychag gulag, a former uranium mine. It seems that each year a handful of motorcyclists doing round the world trips arrive in Magadan, the lone city in northeastern Asia where the Road of Bones ends at the ocean. Winter is the best time to attempt driving the Road of Bones; during summer, the permafrost melts and the dirt road becomes a quagmire, making car and motorcycle travel increasingly difficult. The Road of Bones passes through some of the coldest and most isolated parts of the earth. Its one of the last great adventures, and the final 500 kilometers lead past many of the same points of interest that visitors can see by basing in Magadan.